“When Christ was on earth He picked the flowers and gave them to the children, telling them to study them. “Consider the lilies of the field, how they grow,” He said, “they toil not, neither do they spin: and yet I say unto you, that Solomon in all his glory was not arrayed like one of these.” I have seen the water-lily growing up through mud and filth, yet putting forth pure, spotless blossoms. One day as my husband and I were on the water, we saw some of these lilies. I said to him, “Reach down, and pull up a root if you can.” This he did, and we saw how the beautiful flower was joined by a channeled stem to the root. This channeled stem struck down through the weeds and rubbish to the pure sands beneath, drawing thence the nourishment that gave life to the blossoms of spotless purity. Thus we are to do. We are to separate from our lives all that is evil, that our characters may be pure and spotless. Let the children be taught these lessons. Let them be taught to refuse the evil and choose the good. They will always remember these lessons. “You must have a soul-saving experience. One soul saved is worth a world. I feel it to the very intensity of my being or you would never see me here. Nearly eighty-two years old and yet I feel such an intensity I cannot give up the work. I want that every soul of us shall understand there is a work for each of us to do. We are not to be idlers in the Lord’s field. We are to become helpers with Jesus Christ. That is what you should be, to help lift the burden. One of the disciples who was in love with the Master’s teaching said, “I will follow Thee whithersoever thou goest.” “He turned to him and said, “Foxes have holes, the birds of the air have nests but the Son of man hath not where to lay His head.” Night after night He slept upon the ground without a good mattress. He let us have the word of God to guide us in its simplicity and prize that simplicity in our own lives. What we want is heaven at the cost of all things. What we want is eternal life. What we want is to see souls saved and to know that we have acted a part in their salvation. Every man has a work and to every man it is declared that the Lord has given his work therefore let every influence be exerted to win souls. Christ laid off His golden crown, He laid aside His royal robe. 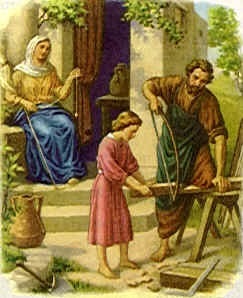 He was willing to do that and come down and be a little child and help his father at the carpenter’s trade. If He was building, He would build surely and safely, that was His work and He calls upon every man and every woman to build characters upon his divine pattern and there it is that humanity grasps divinity. We have got a battle to fight; we have got a heaven to gain, we have got a crown to gain, and may God help every one of us. We want to act as though it were a reality with us. I cannot afford to lose my soul. I want to say to every one of you, for Christ’s sake do what you can. Not a one shall enter into that city that is not an overcomer. Everyone must overcome in this world.